Like I mentioned in a previous article, wins and losses don’t matter in spring training, and for the most part, neither do stats. There is a caveat to the last part, as stats do matter for some. They matter for the fringe roster guys or the top prospects trying to accelerate their ascension through the minors. After an 0-3 start, the Padres have had some encouraging results in the last few games. They have won their last three while getting contributions from many different corners of the roster. Let’s take a look at some of the names most fans are closely watching and how they have fared in the first six or so games of spring. 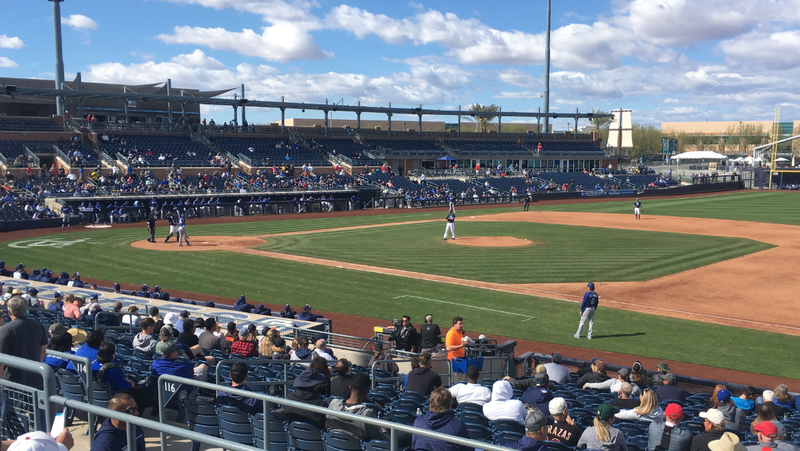 There was much buzz when news broke that Tatis would be invited to big league camp, and for good reason. He is a consensus top 10 prospect and many view him as the future face of the Padres. He is certainly the face of their future. The buzz turned into a swarming hive of jubilation when Tatis hit an opposite field home run in his first spring game last Friday. He struggled after that, striking out four times in the next two games. Wednesday’s win over the Dodgers was a good sign as he bounced back from yet another strikeout in his first at-bat, to collect two hits in one inning, one of them a double, and collecting an RBI and run scored in the process, not to mention the leaping snag he made at short early in the game. 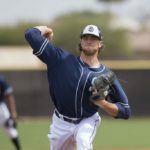 Needless to say, it has been fun watching him in a Padres uniform, even it is spring training. Sure, he has a lot of work to do before he is a 20/20 threat in the big leagues, but he still seems to be on that trajectory that we all hoped he would continue on after last season. I have been impressed with Urias so far. Baseball America’s #32 overall prospect has such a mature approach at the plate and it has shown early this spring. Every one of his nine plate appearances in spring have gone at least four pitches long, except when he doubled on the third pitch in Tuesday’s win over the Mariners. The patience and discipline Urias shows at the plate is something rarely seen in prospects at his level. 3 for 6 with three doubles and three walks is a good way to endear yourself to the major league coaching staff. The kid knows how to get on base. This may not be sustainable, but at this rate, he may be suiting up for real at Petco Park earlier than September. In such a small sample size, the prospect I was most impressed with immediately was Lucchesi. He has only appeared in one game, Tuesday against the Mariners. In his first inning of work, he faced four consecutive MLB All-Stars in Jean Segura, Robinson Cano, Nelson Cruz, and Kyle Seager. He retired three of them, and Cano’s walk ended up being benign. Lucchesi showed impressive deception and control as he pitched two scoreless innings. I know it’s spring training, but any time one of your prized pitching prospects produces weak contact against a stacked MLB lineup, you have to feel good. James Clark recently wrote about the progress of Reyes. He has two home runs this spring and people are taking notice. He has, as they call it, “light tower power.” He is built for power at 6’5″, 240 pounds. We haven’t seen enough of him yet defensively, but the early returns are positive with him at the plate. Cordero certainly made a splash quickly with an inside-the-park home run on Monday as he laced a ball on a line off the wall and it rolled until Monday, allowing him to score easily. He is hitting .385 after 16 plate appearances. He is coming out in a way all of us hoped he would, at least early on. Franchy Cordero just hit an effortless triple to right-center in a "B" game. A couple days ago, he hit a pretty easy inside-the-park home run. It's gotten to where every time up, you feel he might do something exciting that only a few can do. Cordero has shown just about everything he has so far, which is a lot. He still needs to cut down on strikeouts, as he already has five. In a crowded outfield, and Cordero fighting for that fourth outfield spot, he is certainly off to a good start as we head into the middle of spring training games. Villanueva, like Cordero, might force his way onto the Opening Day roster if he continues this trend. He has picked up right where he left off after a hot September, hitting .455 early on in Peoria. His home run was a laser beam. 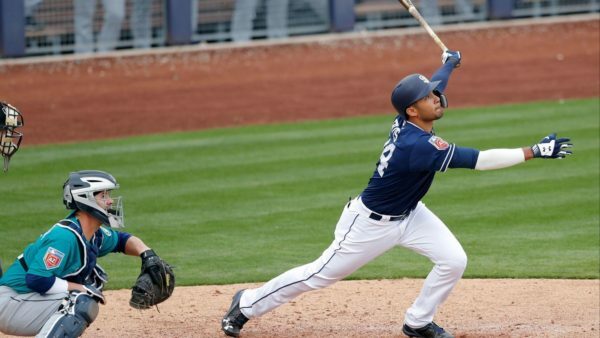 He needs to show more patience at the plate, but if he keeps this up, the Padres will have no choice but to put him on the roster, especially with the fact that he is out of minor league options. After playing everyday last season, Galvis has been impressive early in spring. The Padres traded for Galvis in hopes he would solidify the black hole that has been shortstop for at least this season. He has played sparingly so far, but he has two hits, one of them a double, with two runs scored. He also just missed a home run, slicing it just foul. The Padres won’t ask much of Galvis offensively besides his career averages, but so far, so good at the plate. He gives you that “professional at-bat” people talk about, working the count, waiting for that good pitch with which to make strong contact. New #Padres SS Freddy Galvis has doubled and singled today. In both ABs, he fouled off multiple full-count pitches. He has also been sure-handed at shortstop, like everyone hoped he would. He is a good role model for Tatis and Urias going foward. Established veteran players are where spring training stats turn meaningless. Although, it is encouraging that Hosmer has a hit in each of his first two games, driving in a run in his first game. He is a predominantly ground ball hitter and that has shown early on. For the most part, it’s just nice to see him out there in a Padres uniform, enjoying himself and playing well. We will come back to him come March 29th.